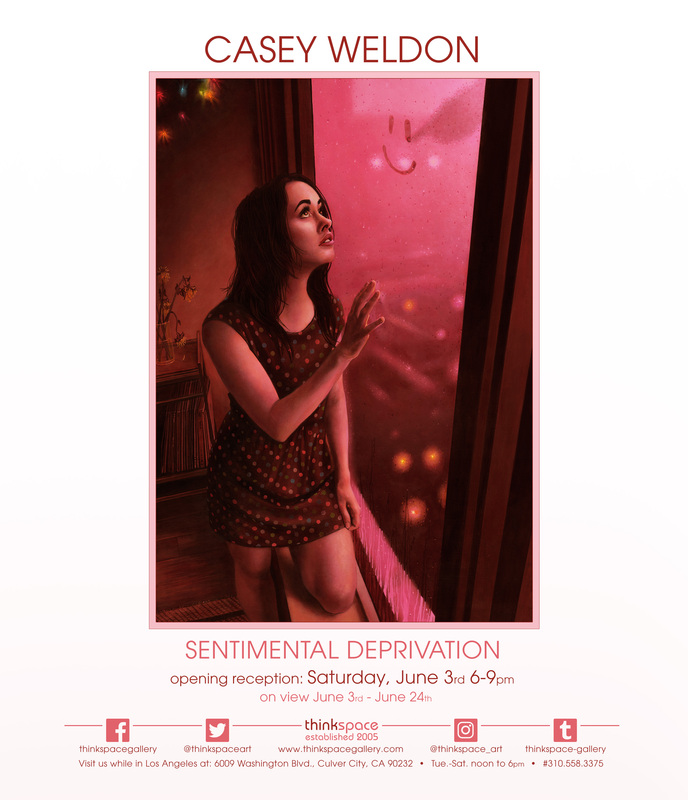 Thinkspace is pleased to present new works by Casey Weldon in Sentimental Deprivation. Born in Southern California, Weldon attended Art Center College of Design in Pasadena and is now based out of Washington, D.C. by way of Las Vegas, New York, and Portland. His surreal paintings combine elements of humor, nostalgia, and the absurd to stage open-ended narratives, and lush imaginary views, that border on the hyperchromatic edges of psychedelia. From optically disorienting four-eyed kittens and seemingly phosphorescent girls to giant disproportionately scaled Chihuahuas in desert canyon landscapes, nothing is too weirdly outré or unimaginable for Weldon’s visual fictions. Unrestricted by the prohibitive constraints of probability, Weldon’s imagination playfully borrows imagery and kitsch from popular culture – past and present – and recombines its familiar fragments into beautifully strange reconstitutions. 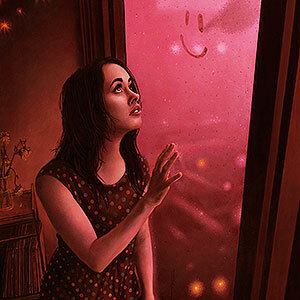 Inspired by the early twentieth century surrealists André Breton and Giorgio de Chirico, Weldon uses similar creative strategies like juxtaposition and stream of consciousness, filtered through a contemporary sensibility, to defamiliarize the familiar and problematize the seemingly innocuous elements of the day to day. Charged with a range of affect that taps into everything from the playful and irreverent to the uncanny and melancholic, his works are beautifully disruptive and galvanized by the unpredictable. Technically, the paintings, though illustrative in style, combine moments of highly-detailed representational realism offset by stylistically surreal introjections. Recurring themes include the exploration of humankind’s tenuous interaction with and coexistence within nature – especially impactful in our era of environmental depletion – and the generative possibilities of extreme displacement and exaggerated context.